This was an interesting tale taking place in the Kushan Empire long ago. It is the story of Jaya whose mother has been called to the palace by the king to make him an apricot cake. She gives Jaya a necklace of 3 coins that her mother gave her when she was young. It will help Jaya while her mother is gone. The next day, her father gets commanded to make a statue of the Peaceful Budha for the king's birthday. He only has 2 days to make it and get it to the capital. When Jaya makes a wish to know what the Peaceful Budha looks like, Shiva, the lord of creation appears and tells her to think peaceful thoughts. She, her father and Shiva carve a beautiful statue. ON the way to the palace, they stop for the night and Jaya is scared, she again makes a wish and the goddess Inanna appears to her to assure her that she is brave and she is able to go to sleep. They meet up with robbers when they are almost at the palace and when Jaya makes a wish, the god Hercules appears and gives her a lion skin which she uses to scare off the robbers. They get to the palace and the king is so pleased with the statue that he lets Jaya's mom return home with them. This is a story that mixes culture, religion, tradition, ancient civilizations and shows strength if you believe in yourself. There are two pages of information about the Kushan Empire at the back of the book. A great story especially if you are learning about other cultures and ancient civilzations.Netgalley provided a copy of this book for me to read and review. I have been for some diverse children's books to read and came across this one on netgalley.Netgalley kindly approved me to read this in exchange for my honest review.I am very pleased with the structure of this story.I thought it told a fun concise but religiously and culturally diverse story.Jaya was cute and it was nice to see her love for her parents in the story and their love for her.I thought the illustrations, although simple, were perfect for the story and the bright colors and backgrounds really evoked the feel of India and I just thought it went well with the story.I also LOVED the end where it gave instructions to bake the cake mentioned, some history on the culture and religion and story origins and basically provided hands on activities to relate to the story. That was an awesome addition to the book.Overall, would recommend it. This is a story of Jaya and how her mother and father were called upon to assist for King Kanishka's birthday. 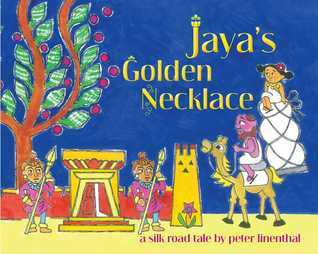 With her mama being called to the Kingdom to bake the King a cake, she leaves a very special necklace with Jaya. Jaya then assists her father in making a statue for the King that they have to deliver in a very short amount of time. During their travels to the Kingdom, Jaya's necklace comes in very handy. There is great information in the last couple of pages of a time many have forgotten. Great Story! ARC through Netgalley for an honest opinion. This book is perfect for exposing children to a new culture, which is something I always tried to do while teaching. I really love the information section in the back.I received a digital copy in exchange for an honest review.